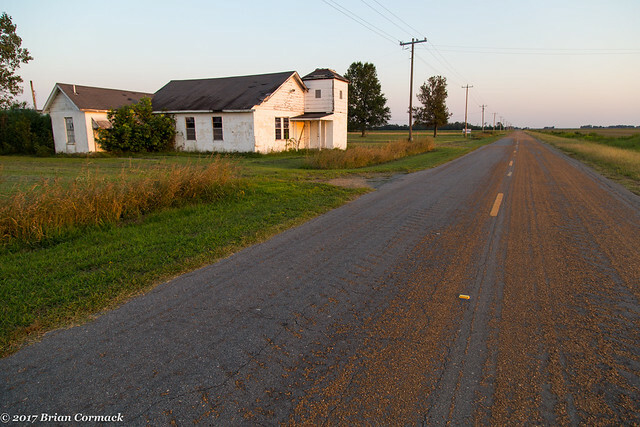 Last weekend, I took another drive through the Delta region of eastern Arkansas. While the Delta lacks the tall bluffs and mountains of the Ozarks and Ouachitas, I think that it's a really photogenic area (and one that I've been working on a photo project on for awhile). 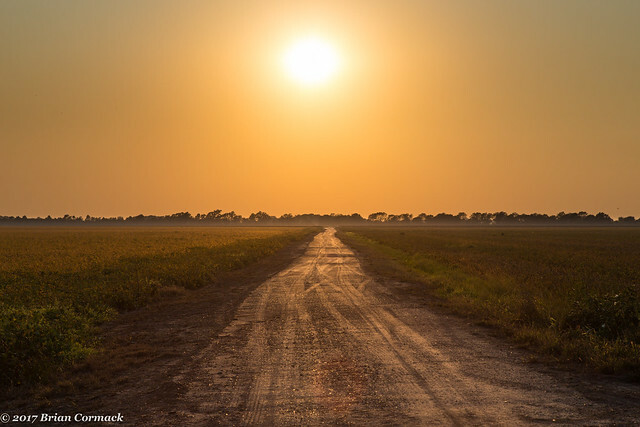 There is a lot of history here, and miles and miles of verdant fields that produce healthy crops of rice, soybeans, cotton and mosquitoes. But it is also a region that has been struggling with a stagnant economy and decades of population loss. Perhaps the best example of this is the city of Pine Bluff. 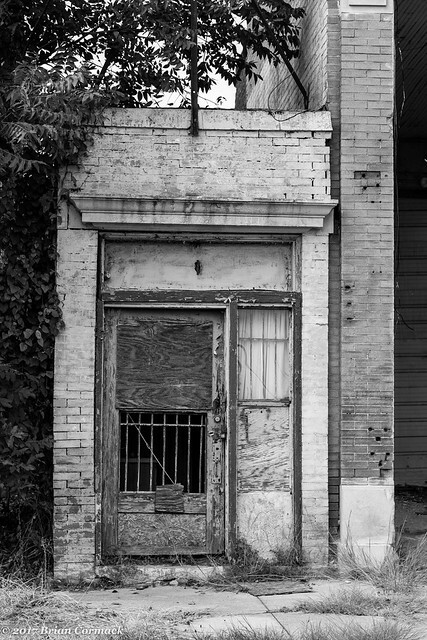 Nearly all of the buildings along Main Street are empty and boarded up, and several have collapsed in recent years. Downtown Pine Bluff was quiet when I drove through, which granted it was a Sunday afternoon but there didn’t look to be another soul around for miles. This old building, which sits right by the train tracks that bisect the town, sits gutted and empty except for water that has flooded the area where the floor used to be. A sign on the broken door said that this used to be a dance studio. But I did drive by a bright spot in Pine Bluff’s future – the old Pines Hotel. 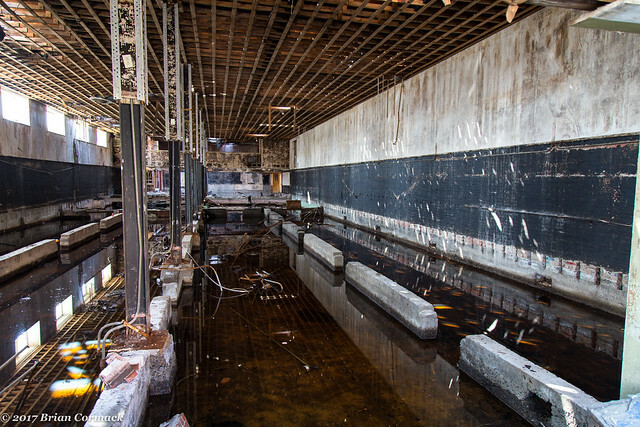 The hotel was recently sold, and actually it was cleaned up and studies are being conducted to see how it can be saved. Hopefully it will be brought back, and then help provide a spark that could bring new life to this part of town. 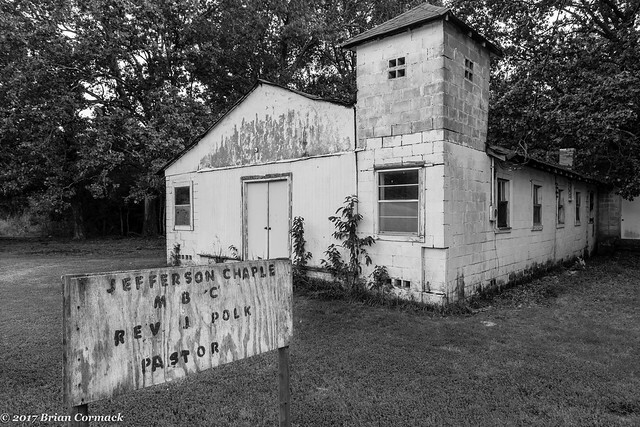 I left Pine Bluff and headed south and stopped by this old church, which appears to not have been used much in the past few years (although someone does mow the grass still). 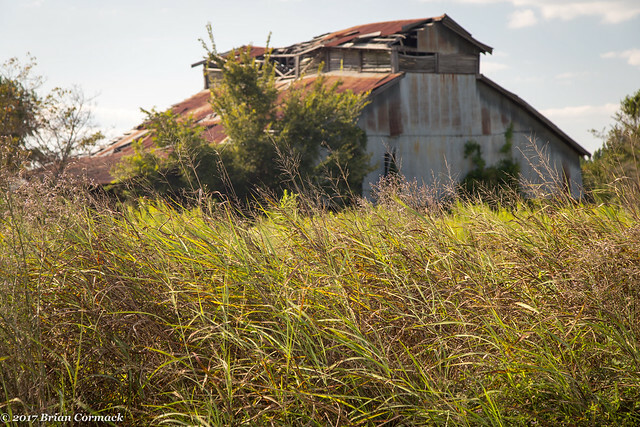 This old barn was nearby, sitting along a dusty dirt road and baking in the afternoon sun. I had some troubles taking pictures in the harsh afternoon light, and also in reaching a few places that I had wanted to get pictures of. One place had "no trespassing" signs posted at it, the other ended up being on private property. Since I really didn't want to be shot by anyone that day, I headed off to find something else to point the camera at. 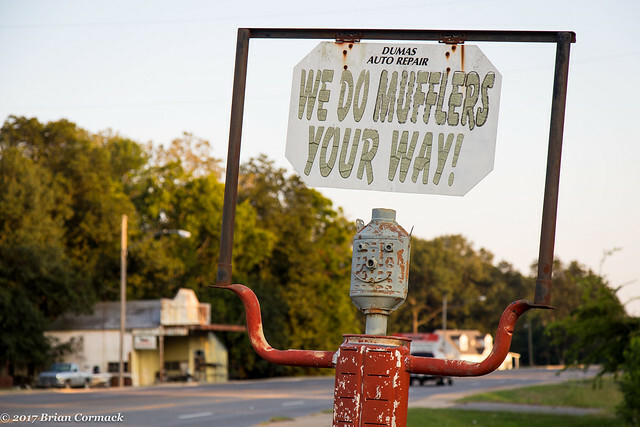 I ended up finding this little muffler man, trying to lure business along Hwy. 65 in Dumas. It was starting to get a little late in the day, and the sun was starting to drift closer to the horizon. This was taken at a field along Hwy. 65 as a freight train rushed by on the tracks directly behind me. Further up the road I passed by another old church, which sat in the golden light from the sun. It also doesn't look like it's seen many services lately, although there was a healthy congregation of wasps guarding their nests along the side of the building. And another view of the church, and the lonely country road that it sits along. 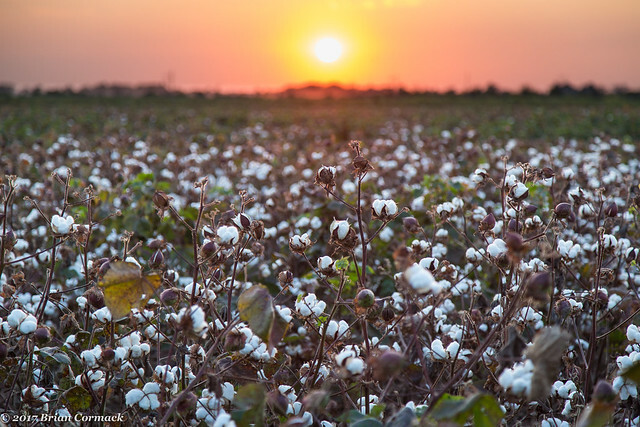 Just down the road, the cotton fields were starting to bloom. 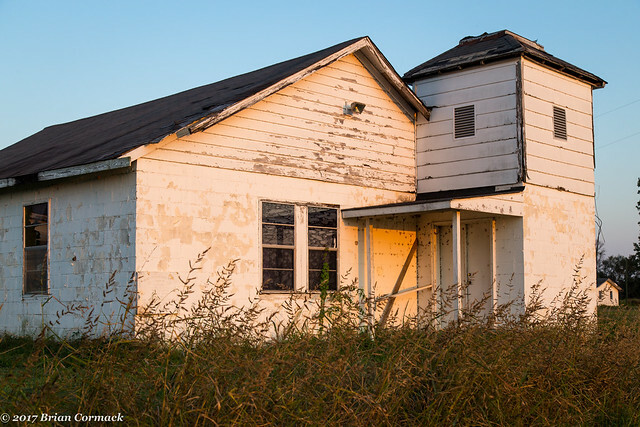 I made one last stop, at an old abandoned house that actually sits in the shadow of the Varner prison unit. I couldn't find any information about the house, which has a roof that has collapsed over the front porch. But there is a small family cemetery that sits nearby, with old graves baring the Varner name. So this might be the old home for the Maple Grove plantation, which the state of Arkansas purchased in 1902 so that it could have land for the nearby Cummins prison. It was a bit eerie to be there, the old house and cemetery overlook the prison that is home to the state's Death Row inmates. I wonder what the people who are buried there would think of their once grand house, now abandoned and collapsing? That their farmlands were sold to a prison system that would house violent criminals, and also the place where those same prisoners were put to death? I assume the Arkansas Department of Corrections is in charge of the property. The grass around the house and cemetery looked to have been freshly mowed, and the graves were in good condition. The only sounds were the chirping of crickets, and the dull rumble of traffic along the distant Hwy. 65. 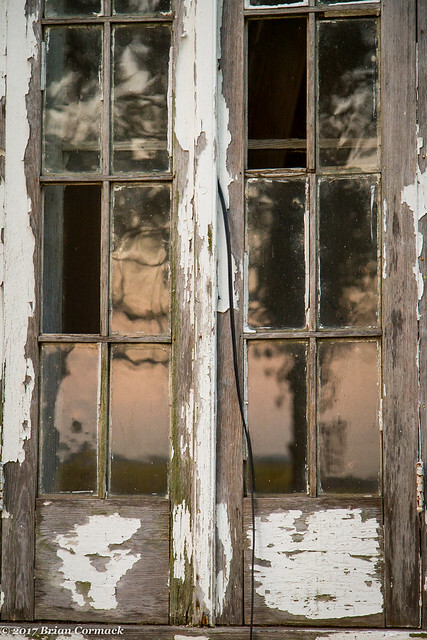 It was starting to get dark, and the windows in the old house were reflecting the last bit of light from the setting sun. The Old River Bridge in Benton is aptly named, since it is pretty old. 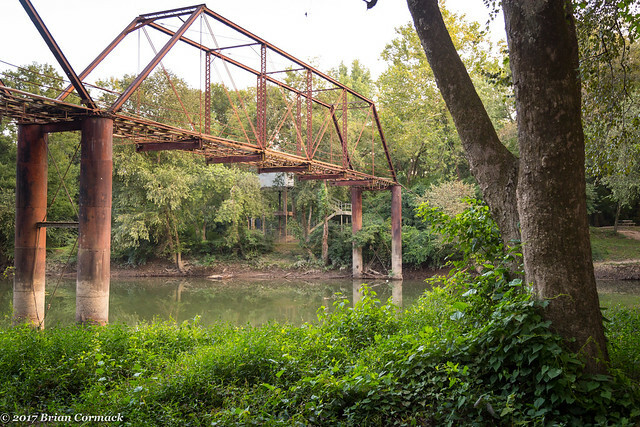 The span over the Saline River was built in 1891, and it's one of the oldest bridges in the state. It was used until 1974, when the wooden platform was damaged by a big truck carrying concrete blocks. After that it was decommissioned, and has quietly sat unused for decades along a lonely stretch of river. But there are plans to repair and renovate the bridge. The span will be a part of a proposed pedestrian and bicycle trail that will link the Little Rock Central High School National Historic Site and Hot Springs National Park. The plans include taking the bridge down, then conducting extensive repairs and then replacing it back in its original spot. Right now the three counties along the proposed trail are trying to secure funding. In 1996, the bridge was featured in the film Slingblade, where Billy Bob Thornton's character was seen standing on the bridge before a pivotal scene. Wait that movie came out in 1996, that's over 20 years ago!!!?! Now I'm feeling old. 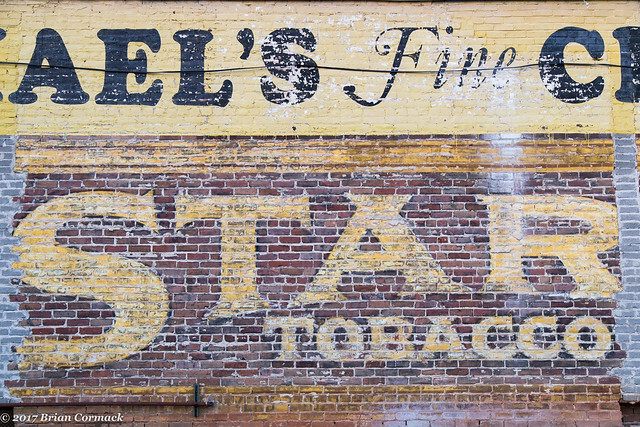 On the way back home, I drove through Benton and stopped to get a few pictures of this old ghost sign that was promoting cigars. The building is right by the old courthouse.